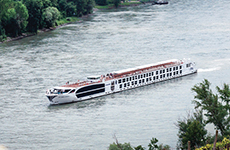 Uniworld's Super Ship, S.S. Joie de Vivre, will bring the “joy of living” to the rivers of France. Step aboard your floating pied-à-terre in France, featuring handcrafted furniture and fine antiques, original artwork, and signature accents inspired by 20th-century Parisian design from the Golden Twenties to the free-spirited Sixties, all blending seamlessly with modern conveniences. Settled by the Celts, Rouen really flourished in the Middle Ages. In a natural amphitheater on the Seine, the capital of Normandy is important as a commercial and cultural center. Today the city is a blend of ancient and modern. Rouen is known as the City of a Hundred Spires; many of its important edifices are churches. The most magnificent one is the Cathedral of Notre Dame, a masterpiece of French Gothic architecture immortalized in Claude Monet's series "Cathedrales de Rouen." Surrounding the large square are picturesque half-timbered houses with steeply pointed roofs. The wealth of architectural treasures and the ambience of Rouen’s historic center will impress any visitor. Exploring the narrow, cobbled streets in the old quarter is a must. The giant clock above the archway spanning the Rue du Gros Horloge is a focal point and famous emblem. Rouen is connected to the sea by the Seine Valley. The city serves as a starting point for trips to Paris and to Norman castles and abbeys. Normandy is a land rich in history which is also perceived by the French as being endless miles of green countryside with abundant apple trees, cattle, creamy culinary specialities and fine cheese. For the Parisians, Normandy is the closest seashore to the city and attracts many artists and wealthy individuals who enjoy spending their week-ends in the elegant resort of Deauville. Caudebec-en-Caux is located on the right bank of the river Seine. The chief architectural interest of the town is its church, which dates back to the 15th and early 16th centuries. Other interesting buildings in the town are the Maison des Templiers (The Templars' House) from the 12th century, which now features a small museum of local archeology and history; a former prison from the 14th century, and the Hôtel de ville which was built around 1800. Mantes-la-Jolie is located to the west of the Paris region. Situated close to the French Vexin Nature Park, Mantes-la-Jolie is a wonderful example of a French counrtyside town. To the east, the town's historical center is overlooked by the Collegiate Church of Notre-Dame. To the west, the Val Fourré district built in the 1960s and 1970s continues to undergo dramatic change. Throughout the year, the town's associations propose no less than 80 sprorting and cultural activities to rediscover each year during the sporting and cultural events season for all to enjoy. Transformed from a hunting lodge into a monumental Chateau, this medieval village and farmland curled around the castle bringing much prosperity to northern France during the 13th century. By late 17th century, King Louis XIV’s transformation of Versailles established the permanent residency of the royal court and government. Simultaneously, a new city was emerging by the decree of the king who would annually tax its residents who purchased land. While population sky-rocketed, so did the city adding new French architectures to the new neighborhoods, churches, markets, and mansions. Versailles’s main attraction is its Palace a status symbol of cultural nobility. Within the Palace are significantly decorated rooms for guests of the royal court who often visit and gardens that hosted grandeur parties for the rich and famous. In 1979, the Palace and Park of Versailles, the epitome of royal elegance of Old Europe, was listed as a UNESCO World Heritage Site. Surrounding Bordeaux are world-renowned vineyards and châteaux. Visitors from all over the globe come here to learn about the winemaking process - from growing grapes to harvesting, fermenting and bottling these top-quality wines. Here in the wine region the title of château can mean anything from a palatial residence to a basic winery. There are thousands of châteaux that rank from very modest family establishments to large famous properties where grapes are raised, fermented and then matured to produce the area’s famous wines. Visit Rue Ste. Cathérine - a half-mile-long pedestrian street leading through the Old Town’s major shopping area and marking the beginning of the elegant 18th-century city. - and Musée des Beaux Arts -- a museum with a large collection of 17th-century paintings by Flemish, Dutch and Italian masters as well as works by Delacroix. Blaye is located north of Bordeaux, on the eastern side of the Gironde estuary in Aquitaine, France. Blaye is a small river port town with a long history of strategic military significance. The Citadel of Blaye and the city walls, constructed around 1685, is a highlight of the town, and is listed as a UNESCO World Heritage Site. The red wines made in the nearby vineyards are another highlight of the area, and wine tastings are held inside the Citadel. Sightseeing in Blaye can be enjoyed by foot, with the 12th century medieval castle ruins, markets, and Fort Medoc on an island in the river as popular highlights of the town. Bourg en Bresse is a charming town in France with much to do. From theatre, museums, The Royal Monastery of Brou to nature activities in Seillon Wood such as horseback riding and biking, there is something for everyone to enjoy in Bourg. Bourg is located approximately 70 km northeast of Lyon on the left bank of the Reyssouz, a tributary of the Saône. Cadillac is located in the Gironde commune of the Aquitaine region in southwestern France. The town was founded in 1280 by Lord Jean I de Grailly whose lush land grew renown vineyards of sweet green and tannin red grapes. The neighboring and competitive towns such as Bordeaux and Sauternes also harvest sweet wines. Centuries of Cadillac’s French-style architecture, grandiose staircases, royal apartments, luxurious French décor, and tasteful art make it an ideal sight-seeing tour for visitors. Active visitors can cycle between French towns and the miles of vineyards or canoe on the River Garonne. Asides from viniculture, France birthed Antoine Laumet de La Mothe, sieur de Cadillac who adopted the commune as his own. A French explorer and adventurer, he discovered today’s Detroit, Michigan - the center of automobile production in the 20th century. The founders of Cadillac Auto Company, paid homage to La Mothe and his feats. St. Emilion is a commune located in southern France, on the banks of Bordeaux. There are many vineyards located along the town, with red wine being one of the most important contributors in the commune. You will also find in the village beautiful chateaus such as the Chateau Fonplegade which also happens to be a winery, and the Chateau Troplong Mondot Castle located just right of the La Dordogne river. Rates are cruise or cruise/land only, per person, based on double occupancy. Port charges of $340 and government fees/taxes are additional for all guests. Fuel surcharges may apply. Please ask your travel counselor for details. Rates are subject to availability and may change without notice. Restrictions may apply. 14-night cruise in a riverview stateroom. *This cruise operates on both the S.S Joie de Vivre & River Royale; guests will transfer ships midway through the voyage.